ALBANY, N.Y. - Reaching the Sweet 16 is basically a rite of spring for Geno Auriemma and his UConn Huskies. They have advanced to the women’s NCAA Tournament regionals 25 straight years. Still, the Hall of Fame coach doesn’t take it for granted. 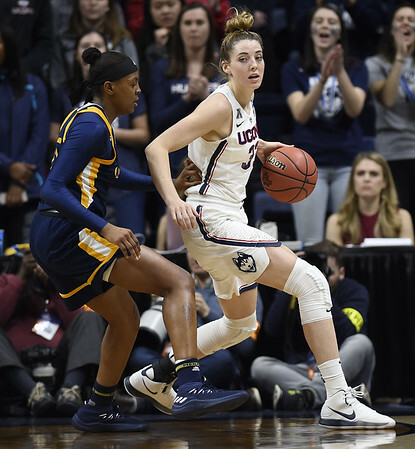 Top-seeded UConn will face fifth seed Duke on Saturday in the Albany Region semifinals. Defending champion South Carolina will face 11th-seeded Buffalo in the first game. The Bulls are one of two 11 seeds to advance to the Sweet 16. After upsetting third-seeded Florida State on the Seminoles home floor, the Bulls aren’t intimidated by South Carolina and expect many of their fans to make the nearly 4½-hour trip across the state from Buffalo to Albany. The Buffalo players are loose and ready for the challenge. FAMILIAR FACE: UConn center Azura Stevens transferred from Duke after her sophomore year and is going against some of her former teammates. She said she hasn’t talked to any of them during the NCAA Tournament. She’s put Duke behind her. “I think that’s what you have to do. Some people are going to say what they’re going to say, but you can’t always let things affect you. I saw the article, but it’s out of my mind. It doesn’t faze me,” Stevens said. “It was definitely hard (deciding to transfer). When I look at being there, it wasn’t all negative. There was obviously things that I didn’t agree with, but I did do a lot of growing there and a lot of learning. Posted in New Britain Herald, UConn on Friday, 23 March 2018 20:06. Updated: Friday, 23 March 2018 20:09.